This is an odd play to come upon at this point, only three texts into my grand project to read all the works of Shakespeare in a year. In truth, it’s the closest Shakespeare ever came to writing the Renaissance equivalent of a spin-off TV show. The story goes that Queen Elizabeth I was so delighted with Shakespeare’s greatest comic creation, Sir John Falstaff, that when he stomped off the stage at the close of Henry IV Part 2, she demanded the playwright write a sequel, bringing the fat knight to England in the modern day and giving him a love story. In some accounts, she was so impatient she only gave him a fortnight to write the play. Wisely, Shakespeare did as the Queen bid him, but – perhaps wary of the possibility of having to write new episodes of The Falstaff Show until Kingdom Come – promptly killed Falstaff off at the beginning of Henry V. But all of that is a long way in the future – somewhere in June, when I’m out of the comedies and midway through the histories. In search of an interesting edition to read the play in, I turned to the bookshelves in the postgraduate office, ever an interesting guide to people’s interests and research topics. My colleague Calum Gardner thoughtfully allowed me to borrow a thoroughly charming early twentieth-century edition, printed in New York and previously belonging to one A. Napier. There was no date on it anywhere I could spot, but it’s dedicated to Sir Henry Irving, a famous Shakespearean actor who also employed an Irish scribbler of penny dreadfuls with the unlikely name of Bram Stoker. Irving also provides part of the introduction to the edition, in a short and a wittily sarcastic essay on the Baconian controversy. His suggestion is that Francis Bacon wrote the entire output of the Elizabethan stage, including Shakespeare, but notes that who actually wrote Bacon’s work for him remains forever a mystery. It seems as likely as any of the other conspiracy theories! 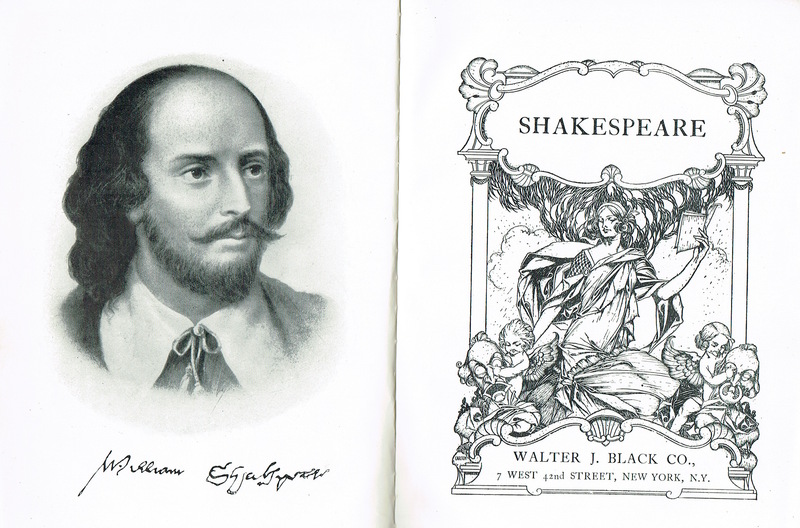 Among the other treasures in the old book are a scattering of early photographs of Shakespearean actors and actresses. 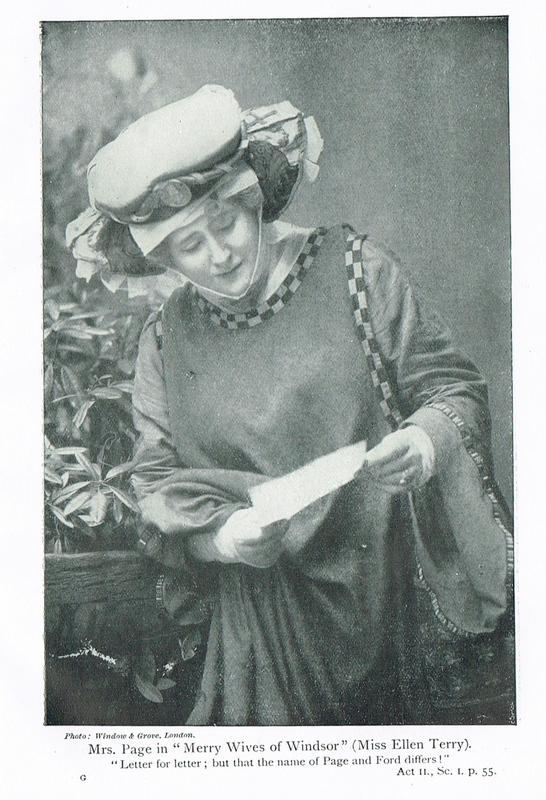 The Merry Wives of Windsor is represented by a studio portrait of Ellen Terry as Mistress Ford; Terry was one of the most famous actresses of her day, now sadly only known for having been Dickens’s mistress. In a delightful period feature, a collection of tabs recessed into the sides of the pages make it easier to flick from play to play. Turning to The Merry Wives, I am struck once again by the comparison to what went before – the language of Two Gentlemen of Verona was elaborate, beautiful and almost constantly in blank verse; Merry Wives is written mostly in prose, and the language is heavily spiced with Welsh and Spanish malapropisms from the two comic rivals in love, Sir Hugh Evans and Doctor Caius. Ford: Well met, Mistress Page. Whither go you? Mrs Page: Truly sir, to see your wife. Is she at home? Ford: Ay; and as idle as she may hang together, for want of company; I think, if your husbands were dead, you two would marry. Mrs Page: Be sure of that, – two other husbands. Actually, my favourite Merry Wives joke belongs not to any of the characters in the play, but to that well-known master of mirth and merriment, Kaiser Wilhelm II. It’s his only recorded joke. Due to wartime anti-German feeling, King George V issued a proclamation changing the Royal Family Name from ‘Saxe-Coburg and Gotha’ to the more English sounding ‘Windsor’. Kaiser Bill shrugged this off this snub by saying he looked forward to seeing a performance of The Merry Wives of Saxe-Coburg and Gotha. Heh. I fancy Shakespeare would have groaned as loudly as the rest of us.